(Bloomberg) -- The surviving members of Led Zeppelin have already said some of their memories of the 1960s are a bit fuzzy. Now they say they can't answer questions about the millions of dollars they made in the 1970s: "These musicians are not accountants," their lawyers proclaim in their latest court filing. Well that's just fine, responds an attorney suing them for allegedly stealing a dead rocker's song and using it as the basis for the totemic Stairway to Heaven. Francis Alexander Malofiy, representing the late musician's trust, asked to delay a Los Angeles copyright trial from May to July so he could have more time, in part to reconstruct the band's finances from thousands of documents. Hold on, says lead singer Robert Plant. The 67-year-old former front-man says he already turned down concert dates in expectation of the May trial, and that the later date would conflict with a European tour. Let's get this over with, the band seems to be saying. This is the latest bit of bickering in an almost two-year battle that's seen clashes over music experts, multi-track tapes, and even where to hold the trial. The case stems from what, to some ears, is a similarity between Stairway and Taurus, an instrumental piece on the 1968 debut album of the band Spirit. Malofiy alleges the opening notes of Stairway, released in 1971 on Led Zeppelin IV, were lifted from it. Plant, along with guitarist Jimmy Page, 72, and bassist John Paul Jones, 70, have all been questioned as part of the lawsuit and deny any pilfering. Plant and Page alone composed the song, they say, though Malofiy has pointed out that band members previously said their memories of the 1960s and 1970s were hazy at best. 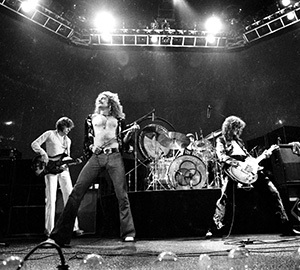 Led Zeppelin broke up in 1980 shortly after drummer John Bonham died. The original recordings of Stairwayhave also become a bone of contention in the pretrial exchange of evidence. Malofiy has said the existence of a "multi-track" version only recently came to light, and he wants a copy to analyze the song's elements. Led Zeppelin lawyers counter the existence of the original, unmixed analog tapes hasn't been a secret at all. Still, they've declined to produce the "fragile and extremely valuable" tapes because, they contend, they're irrelevant. Also, in their latest legal broadside, the band members told a federal judge that Malofiy is being disingenuous about assessing Led Zeppelin's finances, a key component to the lawsuit. The attorney has had six months to question Led Zeppelin's London accountant, the band claims. In any case, if Plant, Page, and Jones get their way, not only will the lawsuit not be delayed; it will get thrown out. Their lawyers say in the new filing that they "are about to complete their discovery and look forward to filing their motion for summary judgment and ending this case." Though the song at issue is perhaps one of the most iconic in rock history, it would seem that the legal infighting remains the same.